By default, new scenes created in Harmony will have a single vector layer. 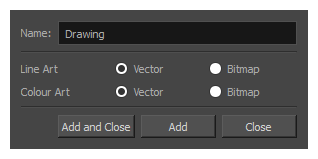 You can choose whether a drawing layer will be a vector or a bitmap layer at its creation. Therefore, if you want to use a bitmap layer, you can simply create one. Each drawing layer in your scene has two sub-layers, referred to as Line Art and Colour Art, each which can be either Vector or Bitmap. When creating a new layer, you can choose whether each of these art layers will be vector or bitmap art layers. The Add Drawing Layer window opens. By default, drawing layers have two art layers: Line Art and Colour Art. If your Support Overlay and Underlay Arts preference is enabled, your drawing layers will have four art layers: Overlay Art, Line Art, Colour Art and Underlay Art. For more information, see Enabling Overlay and Underlay Art Layers . 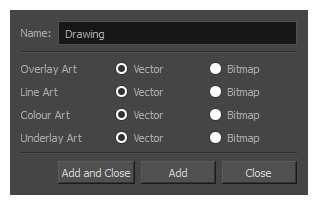 If you want a fully bitmap layer, select Bitmap for all the art layers. If you want parts of your drawing to use bitmap drawing tools and other parts of your drawings to use vector drawing tools, set the corresponding art layers to Bitmap or Vector, depending on your needs.